Park your car in the garage to increase the initial temperature of your engine and cabin. This decreases engine and transmission friction caused by cold engine oil and other drive-line fluids. Limit idling to warm up your car. Most manufacturers recommend driving off gently after about 30 seconds. The engine will warm up faster when driven, allowing the heat to warm sooner, saving fuel and reducing emissions. Combine errands so you drive less often with a cold, less-efficient engine. Tire pressure decreases in colder temperatures so check your tire pressure more often. You can improve gas mileage by up to 3.3 percent by keeping your tires properly inflated. During holiday travel, remove roof-top luggage and accessories as soon as possible. A roof-top cargo box can reduce fuel economy by two percent to eight percent in city driving and 10 percent to 25 percent at Interstate speeds. Fuel economy tests show that gas mileage for a normal car on short, in-city trips is 12 percent lower at 20°F than at 77°F. Gas mileage can drop even more — as much as 22 percent — for errands where you drive only three to four miles. The effect on hybrids is even worse — their fuel economy can drop as much as 34 percent. For more ways to conserve water and energy, reduce waste, keep the air and water clean, and save money, visit TakeCareOfTexas.org. 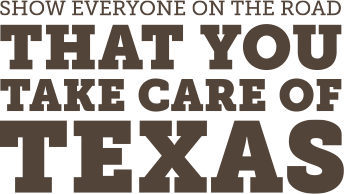 While you’re there, pledge to Take Care of Texas, and we’ll say thanks by mailing you a free Texas State Parks Guide.